Overview - Loveless, jobless, possibly terminally ill, Frank has had enough of the downward spiral of America. With nothing left to lose, Frank takes his gun and offs the stupidest, cruelest, and most repellent members of society. He finds an unusual accomplice: 16-year-old Roxy, who shares his sense of rage and disenfranchisement. Just be nice. Underneath all of the controversial violence and twisted satire, that's all 'God Bless America' is really trying to say. A scathing, hilarious treatise on our declining civilization, Bobcat Goldthwait's darkly comedic tale holds up a bloodied, distorted funhouse mirror to society -- and despite the exaggeration and embellishment, the resulting, grotesque reflection proves to be hauntingly accurate. Through its gruesome and provocative subject matter, the director dares to go where few filmmakers would, lampooning the superficial, selfish realities of our culture with a cynical smile and a devilish wink. While certain aspects of the filmmaking do feel a little rough around the edges, the end results still offer a thought provoking, entertaining, and gleefully warped experience. After being fired from his job and learning that he has a terminal brain tumor, sad, middle-aged divorcee, Frank (Joel Murray), decides to off himself. While preparing to pull the trigger in front of his TV, he is bombarded by a slew of tasteless reality shows and news programs. Fed up with the cruel, selfish behavior permeating throughout our society, he instead embarks on a killing spree, spreading his own brand of justice against superficial celebrities, news pundits, and bigots. Joined by a precocious but deranged teenage girl, Roxy (Tara Lynne Barr), he hits the road, leaving a bloody trail of vigilante mayhem wherever he goes. Starting with a shocking, gruesome, but perversely hilarious opening sequence, the director immediately sets the tone for the twisted tale that follows. Goldthwait's script presents a biting satire on contemporary society's increasing self-centeredness, entitlement, superficiality, and cruelty. Pitch-perfect parodies of reality shows, commercials, and sensationalized news programs are interspersed throughout, and while they are slightly heightened, their content is all too real. The director really gets to the heart of our current collective troubles and presents his scornful commentary in a manner that is both outrageous and sincere. Is his vacuous, fame hungry, self-absorbed depiction of America all that our country has to offer? Of course not -- but it is a genuine and very unfortunate aspect that can't be ignored. Believe me, I've tried. The homicidal characters are not conveyed as idealized vigilante heroes, and their deadly actions are not necessarily meant to be celebrated. Sure, they are our protagonists, and actually do make for fairly likeable leads, but their violence isn't supposed to be taken as some kind of literal call to action. This is a work of satire, and Goldthwait guides his characters and viewers through a challenging grey area. We are meant to question their motives and choices, and for a duo that supposedly abhors society's nastiness they sure are a judgmental and brutal pair. This level of hypocrisy is not lost on the filmmaker, and elevates the material beyond mere psychotic daydream. More than just an exercise in murderous wish-fulfillment, the film becomes a kind of lamentation on our fading compassion, a bullet-laden eulogy for our once great culture -- and it does it all with a sick sense of absurd humor that provides a healthy dose of laughs. Joel Murray has crafted many memorable supporting characters throughout his diverse career. From 'Mad Men' and 'Shameless' to 'The Artist,' the actor always turns in a solid performance, but rarely gets a chance to take center stage. Here, the actor finally gets to stand in the spotlight as a leading man, and the results are fantastic. Murray crafts a believable, sympathetic, loveable loser that instantly endears himself to the audience. While his actions are quite extreme, he somehow remains likeable. Frank starts out fairly innocuous but we can see the rage and vitriol bottling up behind his eyes, leading to a satisfying arc that takes the man full circle. The character gives several heartfelt speeches throughout the picture, and Murray sells each diatribe with a restrained, mournful rage. His partner in crime, Tara Lynne Barr, carries a deviously youthful charisma. Her character is a little less sympathetic and a bit more overtly psychotic, but the pair share great chemistry and the actress does a nice job of counteracting Murray's occasional "grumpy old man" sermons. Though mostly effective, there are a few minor hiccups throughout the running time. Pacing is a slight concern, and while the movie starts off with a captivating rhythm, momentum begins to drag when we reach the half way point. The once explosive narrative loses steam and slightly meanders with a lack of substantial laughs and on screen thrills. Thankfully, this lull doesn’t last for long, and the story soon picks up again paving the way for a riotous climax. Even though I agree with almost everything he has to say, Frank's extended monologues can get a little preachy, and some restraint could have made his arguments even more powerful. The film's modest budget also leads to a few rough patches. Editing, compositions, and staging can be a little clunky and awkward, and certain scenes have a slightly amateur quality. This occasionally unrefined aesthetic is understandable, however, and the majority of the film features a competent and assured visual style. 'God Bless America' is a cinematic wakeup call for our self-centered, belligerent society. Through dark comedy, Bobcat Goldthwait perfectly lampoons egotism and fame-mongering. The subject matter is indeed controversial and violent, but the film has the necessary substance and intelligence to back it up. The homicidal actions of the movie's leads aren't sugar-coated, and while one of the primary goals here is laughter, the twisted humor is complemented by thought provoking observations. As Goldthwait repeatedly imparts in the included special features, this is "a very violent movie about kindness," and the real goal isn't to incite hostility or hatred -- it's to question where all of our common decency and compassion has gone. On that front, the film succeeds and it does so with a cheerfully wicked sense of humor and a surprising amount of heart. 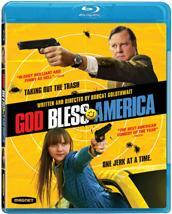 Magnolia Home Entertainment brings 'God Bless America' to Blu-ray on a single BD-50 disc housed in a keepcase. Some skippable trailers play upon start up before the disc transitions to a standard menu. The packaging indicates that the release is Region A compatible. The film is presented in a 1080p/AVC MPEG-4 transfer in the 2.35:1 aspect ratio. Though its low budget roots do shine through, the film's video is pretty solid. The digital source is fairly clean but some light noise is prevalent. While the noise is noticeable it doesn’t prove to be terribly distracting. Clarity is good, but fine details are on the soft side. Colors are often bright and cheery with decent pop, juxtaposing nicely against the story's dark subject matter. Contrast is high with intense whites and black levels are deep and consistent. It's not demo material by any stretch of the imagination, but 'God Bless America' features a respectable video transfer. The film's modest budget and digital shooting methods result in a fairly unremarkable picture, but the visuals are rendered well and serve the story just fine. The movie is provided with an English DTS-HD MA 5.1 track with optional English SDH and Spanish subtitles. The mix is serviceable, but its tiny soundfield lacks immersion and punch. Dialogue is mostly clean but there is some very slight peeking when characters start to shout lines or scream. Also, the film's modest budget does lead to a few instances where speech is overpowered by background effects like wind. The soundstage is disappointingly small with little sense of atmosphere. Certain music cues and faint ambiance do hit the side speakers, but surround use is mostly uneventful. Directionality across the front sound stage is also very basic and subdued. The track does perk up when guns start to blaze, but dynamic range remains comparatively flat, and though bass activity is solid it lacks true kick. The mix gets the job done just fine, but the small soundfield fails to engross the audience. There are a few lively bursts, but the twisted content seems to call for a bit more oomph. Magnolia has provided a nice set of supplements including a commentary and interviews. All of the special features are presented with DTS-HD MA 2.0 sound and no subtitle options. Commentary with Bobcat Goldthwait, Joel Murray and Tara Lynne Barr - The director and stars sit down together for a laid back and entertaining track. The trio offer lots of fun anecdotes about the shoot, spanning a variety of topics. Cameos, story inspirations, various 'Mad Men' connections, and even stoned cinematographers are all covered. Details on accomplishing certain shots are discussed and Goldthwait also distinguishes between the characters' hatred of various topics and his own personal feelings. Filled with a good mixture of humorous tangents and informative trivia, this is a nicely balanced track that fans should definitely check out. Behind the Scenes: Killing with Kindness (HD, 28 min) - Presented in 1080p, this is a fun look at the film's production with lots of cast & crew interviews and behind-the-scenes footage. The movie's themes, controversial violence, inspirations, casting, and stunts are all covered. Goldthwait brings his laid back sense of humor to the proceedings, making this much more entertaining than your standard, fluffy promotional fare. God Bless TV: Deleted/Extended Scenes (HD, 5 min) - A reel of deleted TV parodies and an extended look at the 'Chloe' reality show are provided in 720p. Outtakes (HD, 2 min) - This is a brief collection of fairly subdued and uneventful flubs and bloopers in 1080p. Interviews with Bobcat Goldthwait, Joel Murray and Tara Lynne Barr (HD, 28 min) - Here we get an extensive sit down interview with the director and stars presented in 1080i. Though lots of information and stories are repeated from the previous supplements, there are still some worthwhile insights, and the participants are as entertaining as ever. HDNet: A Look at God Bless America (HD, 5 min) - Presented in 1080i, this is a pretty redundant featurette with clips from the movie and brief interview snippets, mostly culled from the previous supplement. Roxy and Frank Music Video (HD, 3 min) - A music video by Mike Carano inspired by the film is included in 1080i. Theatrical Trailer (HD, 2 min) - The film's trailer is presented in 1080p with DTS-HD MA 5.1 sound.